22 September 2014. Researchers at Massachusetts Institute of Technology are developing ways to fight antibiotic-resistant bacteria by modifying the genes that make the bacteria resistant to drugs. The team from MIT’s Synthetic Biology Group, led by engineering professor Timothy Lu, published its findings yesterday in the journal Nature Biotechnology (paid subscription required). Antibiotic resistance is a continuing problem affecting some 2 million people in the U.S. each year, causing conditions such as multidrug-resistant tuberculosis and methicillin-resistant Staphylococcus aureus or MRSA infections. While infections from antibiotic resistant bacteria can occur anywhere, most deaths from these infections occur in health care facilities, including hospitals and nursing homes. According to the Centers for Disease Control and Prevention, at least 23,000 people die from antibiotic resistant infections each year, but many more deaths can be traced to other conditions complicated by these infections. Bacteria become resistant to antibiotics when strains evolve to replicate in ways that avoid the toxic properties of current drugs designed to prevent replication. That resistance process is exacerbated by the overuse of antibiotics and poor infection control practices. The team from Lu’s lab is taking a different approach from the traditional method of devising new compounds to prevent bacterial replication. 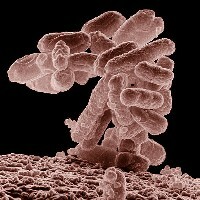 The researchers instead target the genomes that give bacteria the ability to evolve into a resistant strain, with a technique known as Clustered Regularly Interspaced Short Palindromic Repeats, or CRISPR, in effect removing their ability to develop resistance. CRISPR harnesses proteins the bacteria use to protect themselves against viruses that are natural enemies, specifically a protein called Cas9, with the ability to cut strands of DNA. Lu’s team is designing a form of RNA, a nucleic acid related to DNA, that guides the Cas9 proteins to cut specific genes, in this case the genes that enable bacteria to evolve and thus resist current antibiotics. The researchers use plasmids, circular DNA strands found in bacteria, and particles from the enemy viruses to deliver the Cas9 protein. Among their first targets in the team’s tests was the gene expressing the NDM-1 enzyme that creates resistance to beta-lactam antibiotics, a class of drugs including penicillin and carbapenems, often used to treat infections in hospitals developing from catheters and ventilators. Their tests showed virtually all (99%) of the bacteria expressing NDM-1 are killed by antibiotics after being submitted to the CRISPR-Cas9 treatments, while untreated bacteria largely survive. The researchers also successfully tested the techniques with a mutated gene that causes resistance to quinolone antibiotics, used to treat hospital-acquired infections. The tests included E. coli infections in waxworm larvae, where the CRISPR-Cas9 treatments enabled the larvae to survive the infections. The researchers are now conducting tests of the technology with lab mice, and eventually hope to advance the technology to human patients. In August, Lu and colleagues reported an entirely different approach to combating antibacterial resistance, the application of high-throughput genomic sequencing to find combinations of genes that make them more susceptible to antibiotics. The result was Combinatorial Genetics En Masse, or CombiGEM, a library of 34,000 pairs of genes in bacteria coded for transcription factors — proteins that control the expression of other genes — and providing a genetic bar code for each pair. The researchers then applied that library to identify combinations with the ability for antibiotics to kill up to 1 million times as many bacteria as they do now. Their tests with some of the more promising combinations showed they could kill highly resistant E. coli bacteria with NDM-1 enzymes, normally making them resistant to beta-lactam antibiotics.